When following Ghanaian football, one of the most confusing tasks is to keep Michael Ofosu Appiah from Ofosu Appiah. Both players have been playing for Asante Kotoko FC for several years, both players are primarily central defenders and Ghanaian media keep mixing them up to an extent that many football fans actually think this is just one player. Not surprisingly, really, because Asante Kotoko FC is only presenting one of the players in their 2010-2011 squad list at their official homepage. The pictures shows the two different players. The first picture is of Ofosu “Escobar” Appiah . The picture is taken from Ghanasoccernet. The second picture is of Michael Ofosu Appiah “C.I.D.”. The picture is taken from generazioneditalenti.forumfree.it. One of the best ways to keep these players apart, because they really are two different players, is by using their nicknames. Michael Ofosu Appiah is fondly called “C.I.D.” while Ofosu Appiah often goes by the nickname “Escobar”. Earlier this summer, a player called “Ofosu Appiah” left Asante Kotoko FC and joined Jomo Cosmos FC, playing in the South African ABSA Premiership. He made his league debut on 24.08.2011 against Free State Stars FC. When reading the various media sources, it is actually quite difficult to define which of the two players that is currently playing in South Africa. In this article, I will present the careers of Michael Ofosu Appiah “C.I.D.” and Ofosu “Escobar” Appiah, and at the same time try to example how difficult it can be to follow West African football. I will be the first to admit that I have previously confused these players but now it is time to figure this out once and for all. Michael Ofosu Appiah “C.I.D.” was given a seven year contract at Asante Kotoko. Appiah was apparently signed from a club called “Stadium Youth Club”. I have no record of Ofosu “Escobar” Appiah from this season. I have no record of any of the players from this season. In May 2003, Michael Ofosu Appiah was described as a youngster by Ghanaweb. At the time, he was playing for Kotoko African Cup Winners’ Cup 2003. In September 2003, Asante Kotoko FC was preparing for a match against APR FC(Rwanda) in the African Cup Winners’ Cup 2003. Ghanaweb presents “young Micheal Ofosu-Appiah” as one of the defensive players who hopefully will stop the Rwandan attackers. Ghanaweb is clearly referring to “C.I.D.” in these two articles. I have no record of Ofosu “Escobar” Appiah from the Ghana Premier Football League 2003. I have no record of Ofosu “Escobar” Appiah from the Ghana Premier Football League 2004. However, an “Ofosu Appiah” was named in the squad of the Ghana U-17 national football team in August 2004. I personally think this is Ofosu “Escobar” Appiah. According to rsssf.com, “Micheal Ofosu-Appiah”, obviously “C.I.D.”, played for Asante Kotoko FC in the Championship Playoff against Hearts of Oak SC on 03.04.2005. I have no record of Ofosu “Escobar” Appiah from the Ghana Premier Football League 2005. Michael Ofosu Appiah “C.I.D.” was playing for Asante Kotoko FC and had a wonderful season. He was actually captaining the team in certain matches. After the season, Michael Ofosu Appiah, described as a “young defender” at the official homepage of Asante Kotoko FC, had contractual disagreements with his club. Ofosu “Escobar” Appiah was playing for Heart of Lions FC. In March 2007, Ghanaweb publishes an article about Escobar. Appiah is presented as “young Ofosu-Appiah”, a player who has just been picked for the Ghana U-23 national football team. Appiah “has being in fantastic form this season, something which has made him grabbing the headlines of most soccer journal”. Escobar was also picked for the Ghana U-23 national football team in August 2006, October 2006 and for the Ghana B national football team in February 2007. Michael Ofosu Appiah “C.I.D.” was apparently a free agent during the first half of the season but decided to join Kessben FC during the second part of the season. He was described as an “experienced performer”. Michael Ofosu Appiah was captaining Kessben FC in some matches. I have no record about Ofosu “Escobar” Appiah from the Ghana Onetouch Football League 2007-2008. However, I am pretty sure that Appiah was still playing for Heart of Lions FC this season. Michael Ofosu Appiah “C.I.D.” returned to Asante Kotoko FC after his stint at Kessben FC. Kotoko also signed Ofosu “Escobar” Appiah from Hearts of Lions FC before the new season. In November 2008, Ofosu “Escobar” Appiah was presented as a “[t]wenty-year old” player by the official homepage of Asante Kotoko FC. In February / March 2009, an “Ofosu Appiah” was named in the squad of the Ghana B national football team for the 2009 African Nations Championship. According to cafonline.com, the birthdate of the player is 29.12.1988. The official Wikipedia-article of Michael Ofosu Appiah “C.I.D.” presupposes that it was Michael Ofosu Appiah who played for Ghana B in the 2009 African Nations Championship. The official homepage of Liberty Professionals FC has the same opinion. Personally, I am pretty sure that it was actually Ofosu “Escobar” Appiah who played for Ghana B in the 2009 African Nations Championship. None of the players can be considered as regular players for Asante Kotoko FC this season. Prince Anokye, Samuel Enzemoba, Hannan Giwa and Godfred Yeboah all featured regularly and both Michael Ofosu Appiah “C.I.D.” and Ofosu “Escobar” Appiah struggled to get time on the field. Both players were still playing for Asante Kotoko FC and managed somewhat better than the year before. I think Michael Ofosu Appiah “C.I.D.” played 15-18 matches during the season, while Ofosu “Escobar” Appiah managed 10-12 matches. Kickoff.com states that it was “Ofosu Appiah”, apparently Escobar, who was in the Ghana-squad. However, Transfermarkt thinks it was actually Michael Ofosu Appiah “C.I.D.” that played the match. During the season, I was able to get an official player registration document from the Ghana Football Association. In this document, Michael Ofosu Appiah is registered with the birthdate 31.03.1983. His former club is listed as Kessben FC, making me almost certain that this is “C.I.D.”. This also makes sense as it would imply that he had just turned 20 when he started to play in the Kotoko defence in 2003. Both players were still playing for Asante Kotoko FC. Before the season, the players of Asante Kotoko FC voted over who would be the team captain. Michael Ofosu Appiah became number three in the vote. Ofosu “Escobar” Appiah had a difficult season due to disciplinary issues and inactivity. In July 2011, after the season, Escobar was undecided about his future. 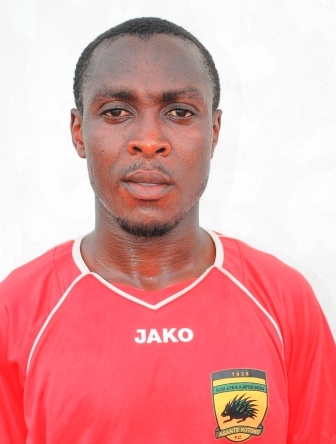 According to Ghanasoccernet, Michael Ofosu Appiah agreed to stay with Kotoko in August 2011. Confusingly, Ghanasoccernet is stating that also Michael Ofosu Appiah had disciplinary issues during the season. Allafrica also suggests that it was Michael Ofosu Appiah who faced sanctions from the club. Personally, I think these articles are in fact referring to Ofosu “Escobar” Appiah. I think Michael Ofosu Appiah “C.I.D.” played 7-10 matches during the season, while Ofosu “Escobar” Appiah managed only 3 matches. 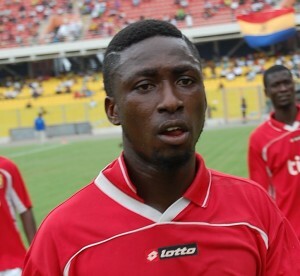 Nevertheless, Ofosu “Escobar” Appiah was considered for the Ghana B national football team in November 2010. Just as an example of the confusion in Ghanaian media: during the season Ghanasoccernet, wrote that Michael Ofosu Appiah’s nickname is “Escobar”, which is clearly wrong. On 24.08.2011, an “Ofosu Appiah” made his debut in the South African ABSA Premiership for Jomo Cosmos FC against Free State Stars FC. According to the official homepage of the ABSA Premiership, the player at Jomo Cosmos FC is “Michael Ofosu Appiah”. On 07.08.2011, Ghanasoccernet published an article called “Michael Ofosu Appiah to sign for Jomo Cosmos”. However, the text in the article is clearly referring to Ofosu “Escobar” Appiah as he is described as a 22-year old player who joined Kotoko two seasons ago from local Premier League side Heart of Lions FC. Transfermarkt is also confused and suggests that it is “Michael Ofosu Appiah”, born 29.12.1988, who has joined Jomo Cosmos. Jomo Sono, the coach of Jomo Cosmos has stated that the club had signed “the captain of Asante Kotoko”, implying that it is actually Michael Ofosu Appiah “C.I.D.” they have signed. I am almost certain that Ofosu “Escobar” Appiah has never captained Asante Kotoko FC, which Michael Ofosu Appiah “C.I.D.” obviously have. In other words, I think that it is Ofosu “Escobar” Appiah who joined the South African side Jomo Cosmos FC earlier this summer. It also makes sense that Escobar was 15 years old (almost 16 years old) when he was picked for the Ghana U-17 national football team in 2004. It also makes sense that Escobar was about 18-19 years old when he has part of the Ghana U-23 national football team in 2006-2007. I also believe it was Escobar who played for the Black Stars against Argentina in 2009. This is also based on the picture found on FIFA.com. Most sources describe the player who joined Jomo Cosmos FC as a “22 year old” player. This is fitting with the birthdate 29.12.1988. This also means that the Wikipedia-article of Michael Ofosu Appiah “C.I.D.” should be changed as it is clearly wrong. I must amplify that I am not sure about my conclusions but until I am proven wrong, the profiles above will be my “official” profiles of these two players. Avalanche hoods will add a new feel and style to your vehicle. right to the end. Proserpina was abducted against her wishes hence the adjective ‘tearful’.